I've been loving Topshop and their beauty range so much recently. I picked up this lipstick in Rio Rio, which is a bright red shade with orange undertones. I should of probably swatched this next to a really red lipstick so you could see the orange undertones in it. 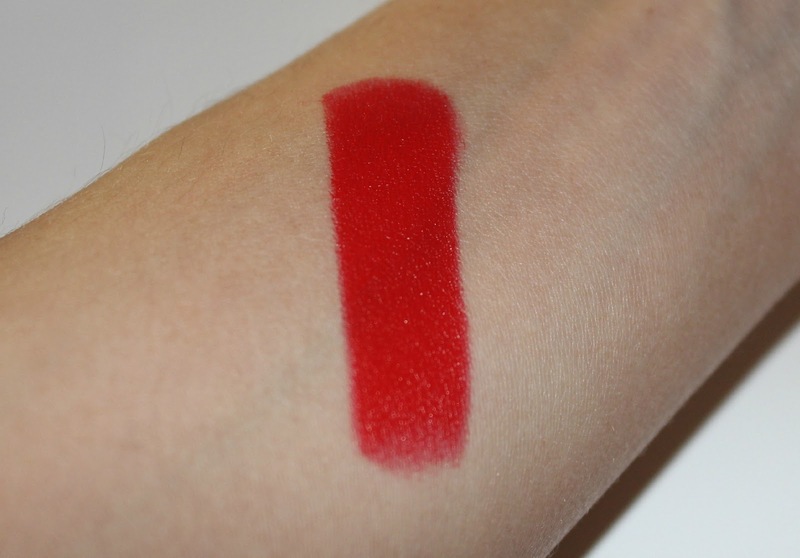 As you can see from the swatch above Rio Rio is extremely pigmented. I've always been a little scared to wear orange on my lips, but I always think it looks so nice when I see it on other people. This is probably the safest option though! I can imagine this lipstick to suit most skin tones as the orange in the lipstick really brightens up the whole face. Rio Rio is a satin matte finish, I found this lipstick more moisturising than most matte lipsticks. So it glided onto the lips just lovely with no pulling. I haven't had any dryness or flakey lips like I usually get with a matte finish. the staying power lasted a few hours and after transfer it did leave a nice stain to my lips. The swatch that was done for this post must of been on my arm for about 8-10 minutes and it stained right away. This lipstick was only £8.00 and it was well worth purchasing. I'd say they are quite comparable to your higher end lipsticks like I mentioned in my previous post about Lips In Peach Sundae. There's a lot of people that say they are on par with MAC lipsticks, but there's obviously not as much colour choice. Have you tried any of the Topshop lipsticks? Which one do you like if so? Waw! That red is so... RED! Love it! Nothing worse Han a drying matte lipie, so this sounds fab. I bet it looks gorgeous on you beaute! I only own one unfortunately in Beehive, a lovely pink.